Combination machines are often underrated, or overlooked when considering workshop machines. If you have the space, then a machine dedicated to one task must be better than one trying to be all things to all people right? It is the public gym vs infomercial war all over again, in some minds: don’t buy a machine that can only do one thing, buy this workout zone for home and get 99 functions in 1. Sounds great, but we also know for these sales pitches, the resulting contraption is built cheap. After all, you don’t get 1 for 10 easy payments of $99.95, but they will throw in a second one for free, and an exercise mat to boot. If you have the workshop floor area, why would you consider a combo machine, when 2 or 3 individual machines, each dedicated to the one task must be better. Well that is not always the case. There are a number of reasons to consider a combo machine in the workshop. Overall, it will typically be a lot more expensive than one of the machines it is replacing, but add them all together, and the price starts becoming rather competitive. Unless you own the Taj Mahal of sheds, we are all space-poor to one degree or another, and some machines can be combined to minimise their overall demand on space, especially where they can share common infeed and outfeed areas. If you buy a jointer, a 6″ jointer is a reasonable price, an 8″ adds about 60% to the price, and a 12″ about 4x the price. 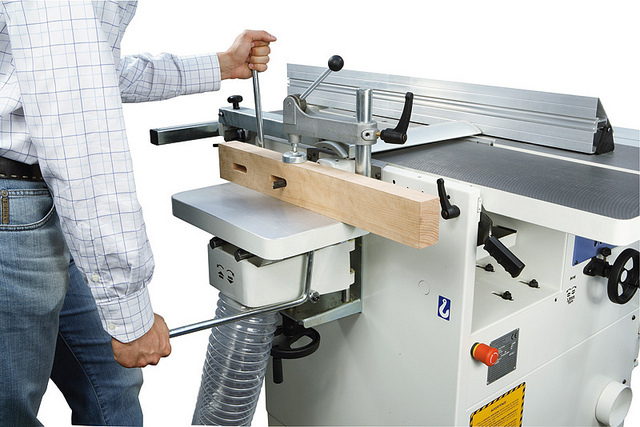 It means as a stand-alone machine, few will be able to justify a 10″ – 12″ jointer. But if you get a combination jointer-thicknesser, a 10″ or 12″ capacity for the jointer is not uncommon. It makes me really wonder why the stand-alone jointers of that size are so expensive? You can buy a 15″ thicknesser for a fraction of the price of a 12″ jointer. 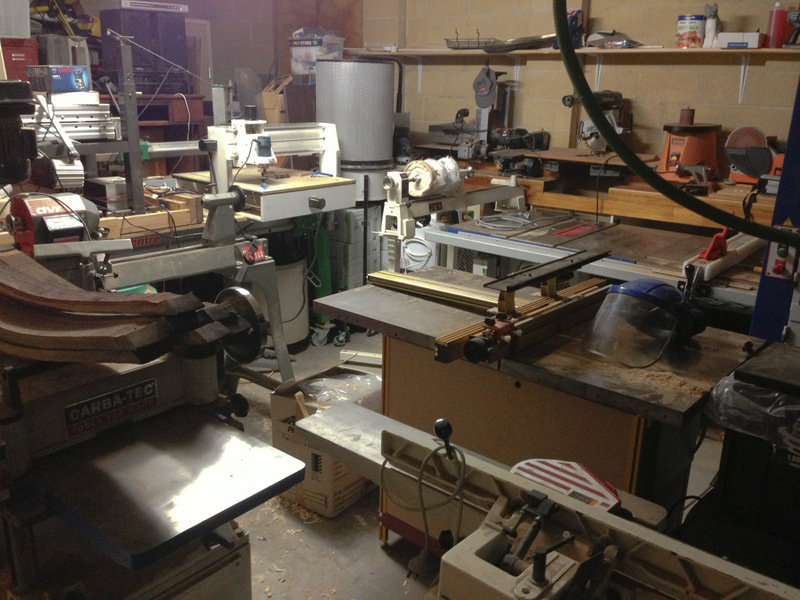 A combo machine like a jointer/thicknesser is just that, a couple of machines combined. But what about the multi-machine combinations? 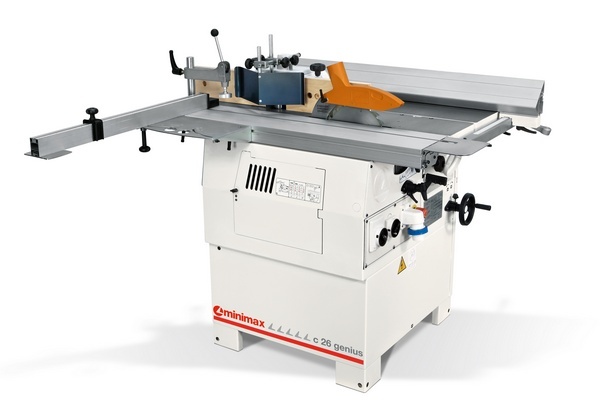 The MiniMax C26 for example combines a 10″ tablesaw (with sliding table), a 10″ jointer, 10″ thicknesser, a spindle moulder, and optionally a mortiser to boot. You may be looking for the typical combo of the saw, jointer and thicknesser, which means the spindle moulder and mortiser are bonuses – you may not have planned on buying them otherwise, but who’d say no if they are included? So let’s look closer at the C26 particularly, as it is one that I saw at my recent road trip to Gabbett Machinery. C26 footprint 5.2m2 (that includes the area of the sliding table with the arm out at an operational position). And this is just the foot print of the machines themselves, not including the typical amount of space you’d leave around each machine for access, or the infeed and outfeed areas, which is significant! 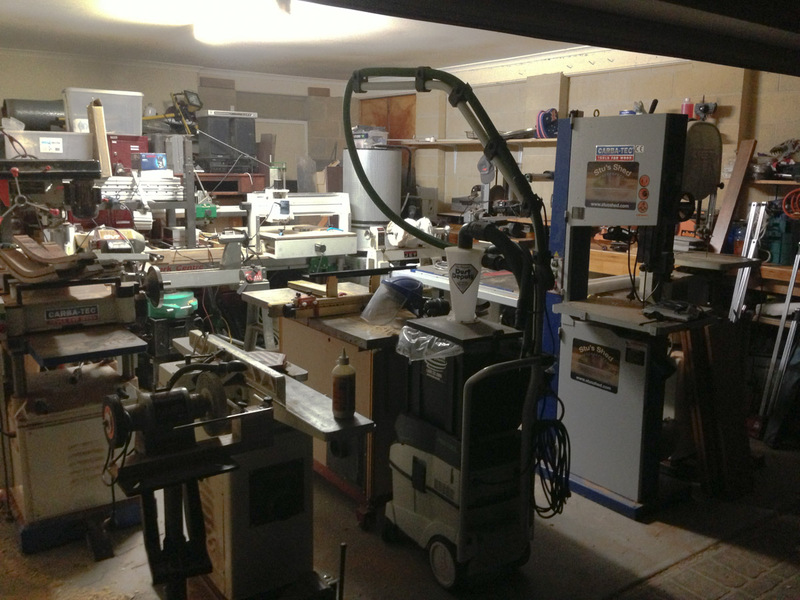 There is no question about it – a combo machine saves a fortune in shed space. 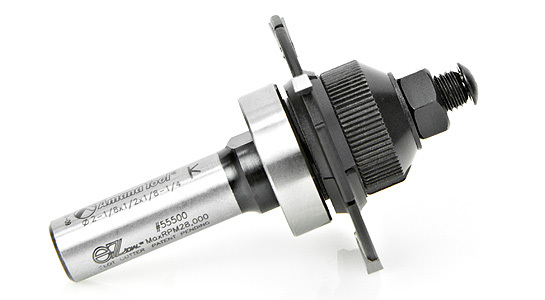 The increased capacity is primarily around the jointer – getting a 10″ jointer or larger is exceptionally expensive stand alone, but not so much so when part of a combination. The 6″ jointer I have has always been quite a limitation for me – couldn’t justify getting a larger one, but have often found it to be a limitation. As to machines you wouldn’t otherwise have, that is a personal issue. For me, I don’t have a mortiser or spindle moulder, so that would be the win from having a combo (not to mention the increased jointer capacity). The other thing I don’t have is the sliding table, which can prove exceptionally useful if you are trying to do a lot of crosscutting on the tablesaw. So unlike cheap exercise equipment sold on late-night TV, a serious combo workshop machine is something well worth considering when looking at setting up a workshop. They are not cheap, but as shown, it is comparable to the machines they replace, and they save a fortune in workshop real estate. As I am discovering with the current shed build, workshop floorspace is worth a small fortune, and being able to save many multiple square metres is worth a lot, much more than the cost of the machine. The Minimax C26 in particular was from Gabbett Machinery. So there I was, trying to work out the plans for the shed, and things were just not working as well as I expected, and I put it down to the fact the components I was working with on the Grizzly Planner were not to the same size (scaled) as I needed them to be. 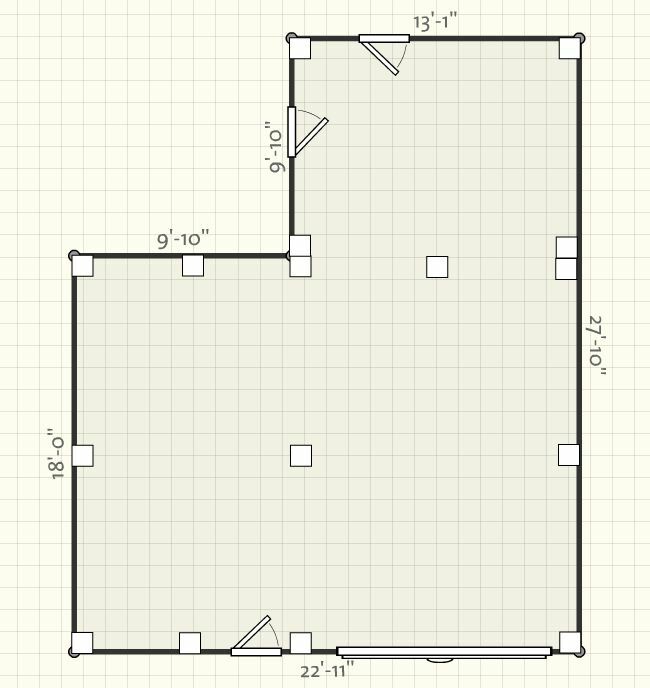 But then I tried a major rearrangement, putting the tablesaw down the back of the proposed shed, and couldn’t get it to fit. Shouldn’t I have a metre clearance? 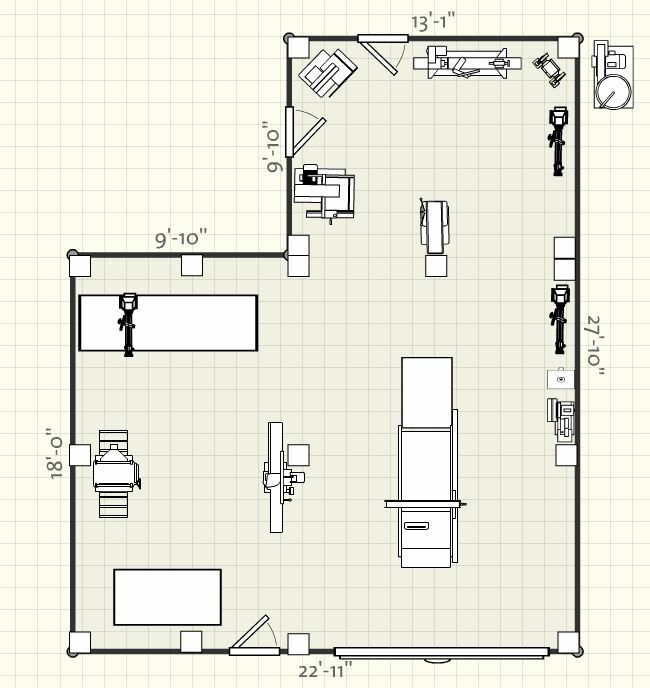 So I checked my dimensions. Then checked them again. And I finally got it. 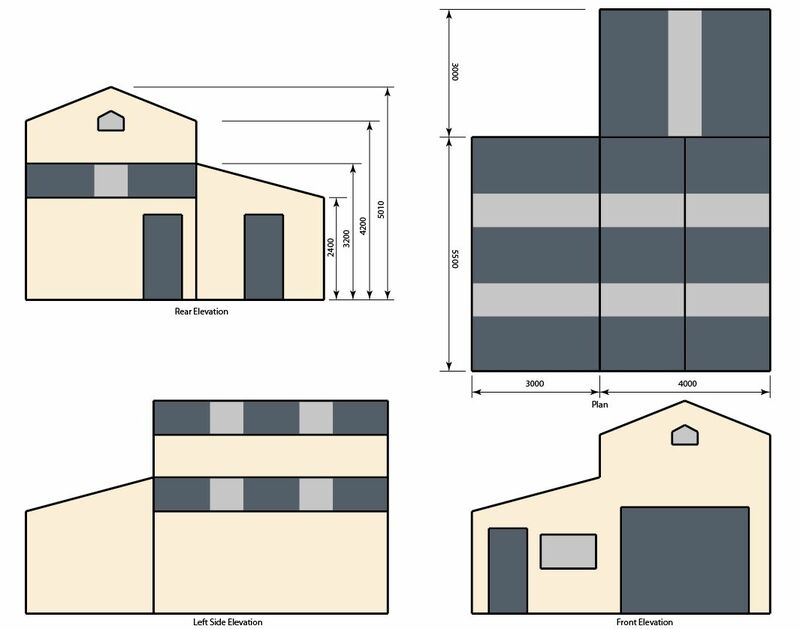 The shed was drawn completely the wrong size. The problem with working in feet & inches, is I don’t know what 96″ looks like (or whatever). It is not intuitive to me, having primarily worked in metric. 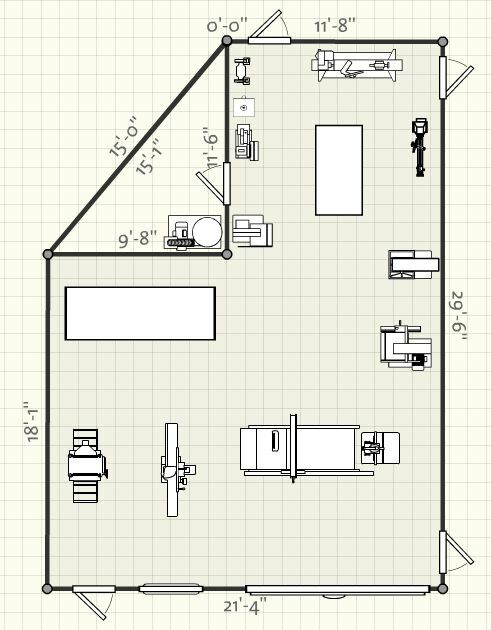 So I then redrew the shed to the right size, and then tried placing in the tools. Everything looked completely wrong – all the tools have just too much room. How can that be? Checked. Double checked. I think it is right. WHOA! Awesome! Some really interesting progress on the shed front – hope to have an update around the end of the week (or there abouts). 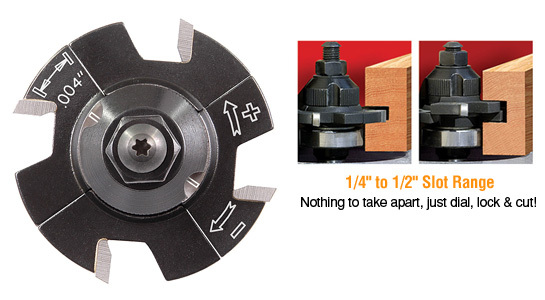 The dado blade (or dado set) can be a particularly accurate tool when it is understood correctly. With a combination of spacers and shims, a dado (or groove) of very precise width and depth can be cut in a single pass. 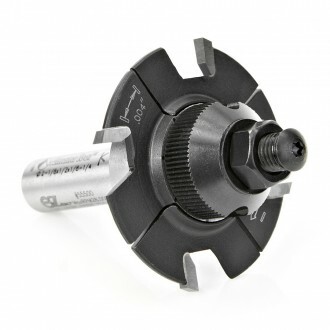 Unlike a router bit producing a groove, the size of the stock to fit that groove does not have to match the router bit, nor do you have to make multiple passes to get to the required width, or depth. The tablesaw is also much more suitable for processing large amounts of stock, and long lengths. Click here to see the blade at Toolstoday.com Don’t worry that the blade is not blue – the photo has not been updated yet to include their latest coating that is now standard on their blades. It is a particularly nice set, with four 1/8″ spacers and one 1/16″ spacer (or chippers), and a set of shims of various widths. The outside blades (which must always be used for every cut) are dedicated left and right (as is normal for dado sets). The blades are not ATB – they are either bevelled left, or right only (depending on which blade it is), with every 6th tooth being flat ground. They each have two teeth missing – this allows a place for the chipper blade to rest, so that the carbide teeth can overlap without knocking into each other. The flat ground teeth result in square corners at the bottom of the groove. Many other dado sets leave a telltale triangle cutout, where the bevel cuts deeper than the chippers. 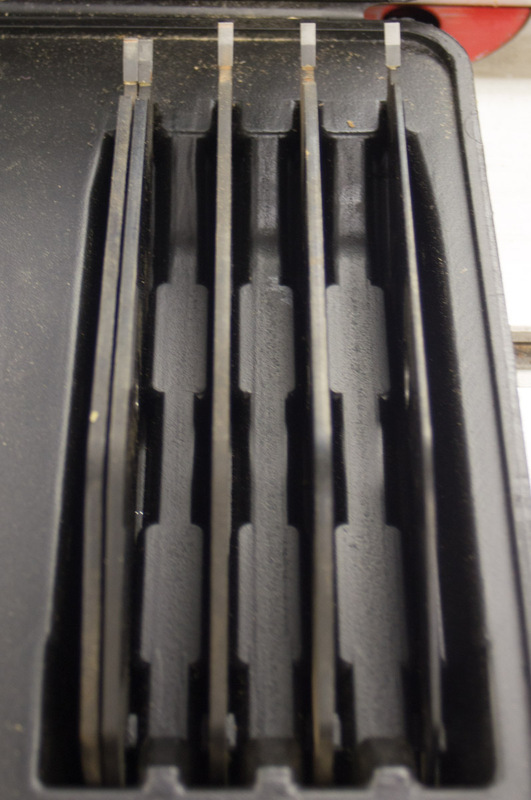 An interesting feature of the outside blades is a raised section on the inside, effectively increasing the thickness of the blade, and when not using any chippers or shims means the two outer blades can rest against each other, again without the carbide teeth impacting. This particular dado set has only 2 tooth chipper blades. This may seem a disadvantage (the general principle is the more teeth a blade has, the finer the cut), but the chipper blades don’t impact the side of the cut, where smoothness really counts. 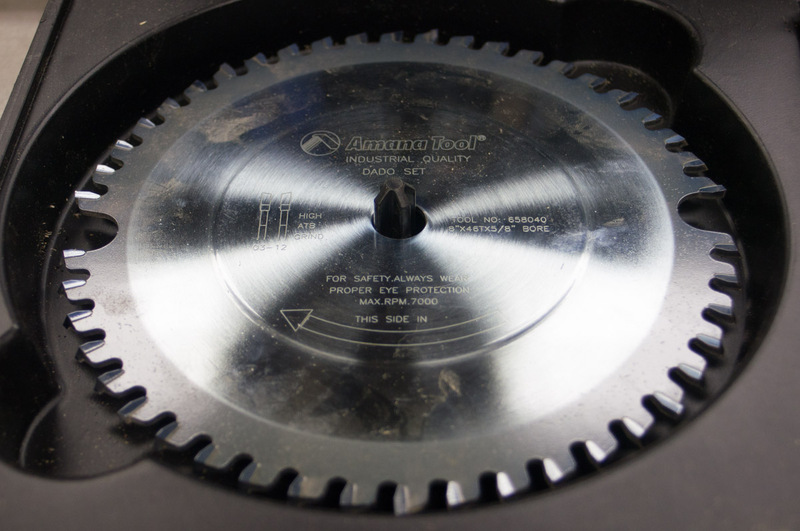 Chippers only remove the material in the middle of the groove, so they only touch the bottom of the cut, and with a combination of the quality of the carbide, the angle of the grind and these chippers leave a very smooth finish. The other really important aspect is the chipper blades have to be exactly the same diameter as each other, and the outside blades. This leaves a flat-bottomed groove. If one is over (or under) sized, it leaves a step in the groove base. As you stack the dado set, you stagger the individual blades so that the carbide teeth have no chance of pressing on each other. Other than risking damage to the teeth, if they are pressing on each other, they will distort the effective width of the dado stack. 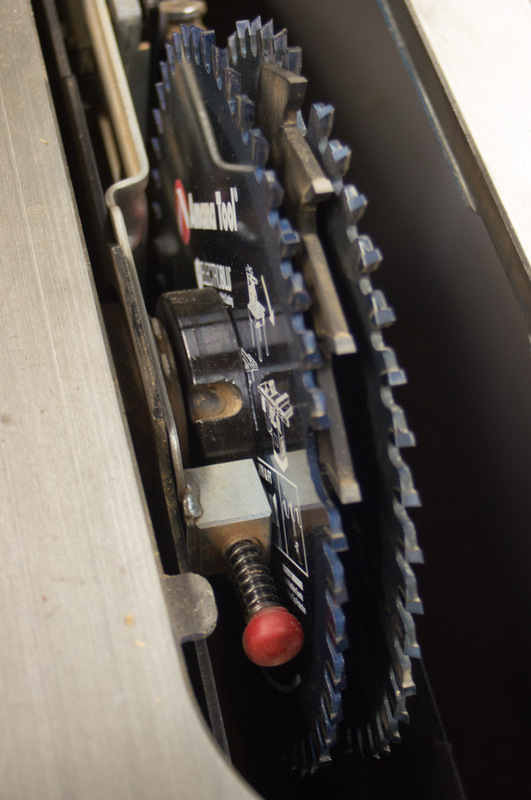 When using shims, you need to space them out between each of the blades used. It is a good idea to put the thinnest ones nearest the arbor washer & nut. That way it is easier to change the finest shims to fine tune the effective width of the stack. When measuring the width of the blade stack, you cannot simply add up all the width of the components. 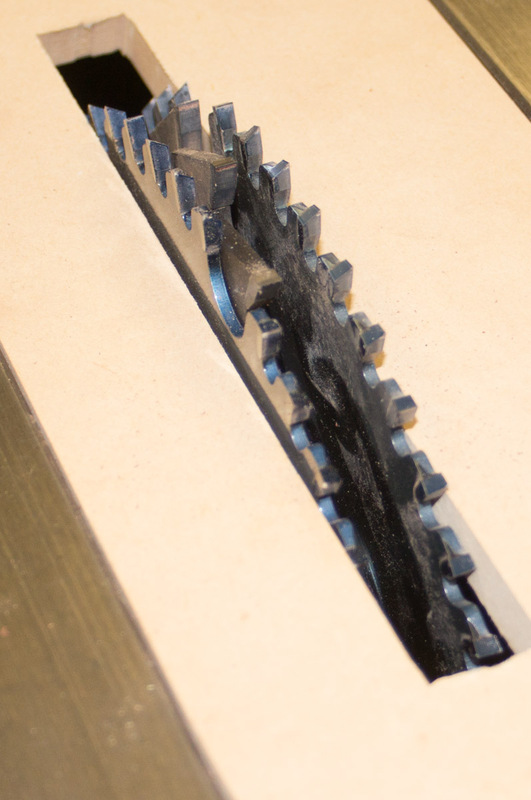 The amount of runout of the two outside blades (in particular) (and to a lesser degree, the runout of the chippers) needs to be added to the final width, as does the runout of the tablesaw itself. This can be determined by trial and error. Set up the stack for a certain width of cut (adding together the kerf of the outside blades, the chippers and spacers used). Perform a cut, and measure the result. This will give the actual width of the cut, and the difference between the two is the runout of the stack and tablesaw combined. Despite the fact I have a 10″ tablesaw, an 8″ dado blade set is more than enough. 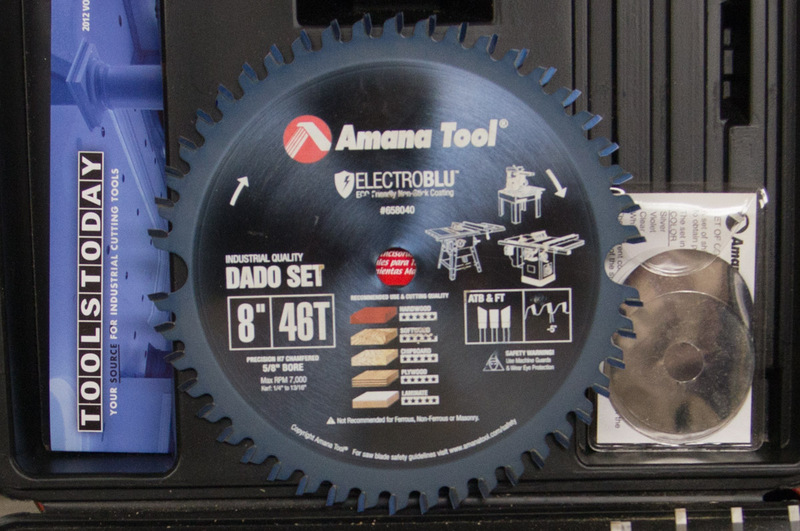 There are a number of reasons for this: Unlike a normal blade, the dado set is only ever for cutting a groove (and more often than not, no more than 1″ deep). There is therefore no need to incur the extra expense of a larger blade. A dado set is already much heavier than a single blade, and can really push the limits of the saw motor just to get it up to speed, let alone maintain that speed during a cut. A larger blade has significantly more bulk and mass, and can exceed your saw’s capacity to spin it up. The benefit of this set, is those 2 tooth chippers have a lot less bulk than other chippers, so this also helps deal with the overall bulk of a dado set. The other thing is that a dado blade really does not need anywhere near the depth of cut of a standard blade. It is for cutting grooves, not cutting workpieces in twain. As far as how this blade performs, it is excellent – but you’ll have to see the associated video (which I am working on) to see the result. Needless to say, I had a precisely cut dado that absolutely matched the board I was inserting, so the friction fit was beautifully tight. To get that precision, I took the typically supplied notes on the various combinations of blades, chippers and shims to achieve a standard set of widths, and threw them out the window. Instead, I came up with a comprehensive set of every single combination possible, in order of increasing width, so I can exactly choose what combination to start with to match the board I am inserting into the resulting groove. Instead of having about 24 combinations that were provided, my list is just over 3000 combinations. 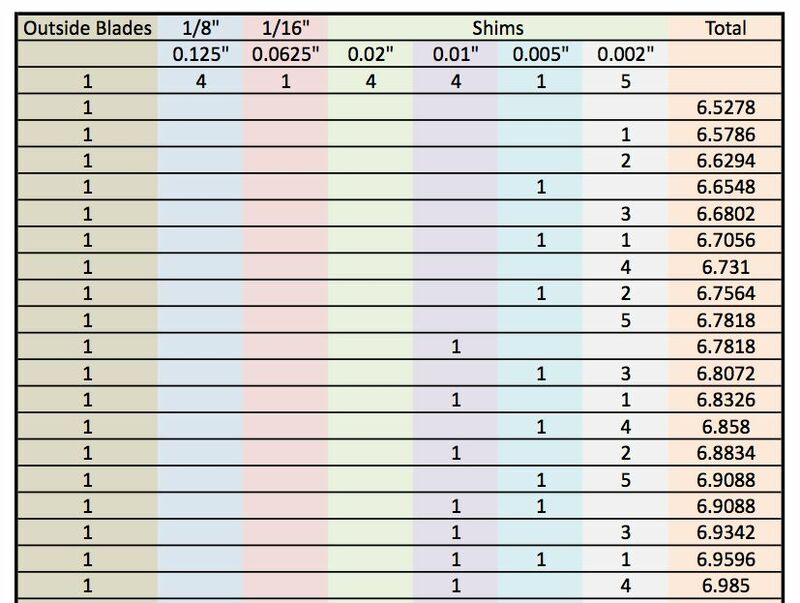 And because I have it in Excel, it is easy for me to add in the runout of the blades and tablesaw to end up with even more precision. 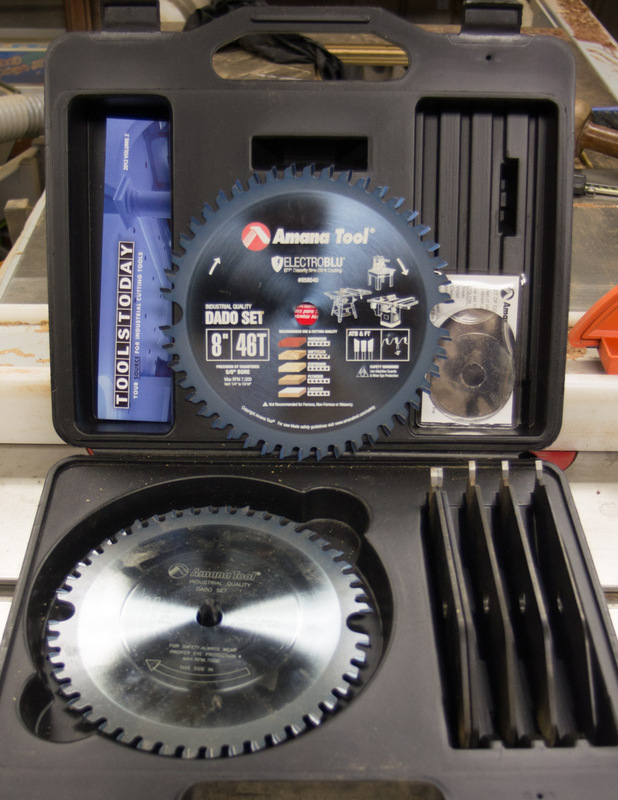 The Dado set by Amana Tool, from Toolstoday.com is a worthy version, and well worth considering when looking for a dado set for your workshop. When the video comes out, you will see just how precise a dado set can be!